We’ve featured two of the most major event cities in the country, New York and Washington D.C. but the truth is, cities all over the country, big and small are popping up with some amazingly unique venues that are redefining what it means to be “corporate appropriate”. Hotels are jazzing up boring ballrooms, and other unique venues are of appeal for the corporate crowd who is looking to modernize their meeting. San Diego, California is no exception to this wave of venue revolution. Its no secret that the EOE team avoids hotel event spaces like the plague, but it’s new hotels like The Pendry in Downtown San Diego that could make us reconsider. This boutique hotel boasts 2 ball rooms, 4 meeting rooms, and 6 restaurants and bars! Let us say that again – 6 RESTAURANTS AND BARS! Carry out your day program in one of their well designed ballrooms and when it comes to lunch or reception time, you can create an experience that is perfectly on brand. We <3 options. Speaking of options, Liberty Station has 10 indoor and outdoor spaces perfect for the year-round comfortable climate in Southern California. This former Naval Training Center of San Diego has now been transformed into functional event spaces. The venue mixes modern amenities with the historic barrack buildings for the perfect setting. Liberty station is located directly next to the airport and a bit outside of downtown, so no matter where your attendees are commuting in from, it’ll be a breeze. There’s always that one client who loves the WOW factor of a downtown top floor rooftop with view for days, and how can we blame them? 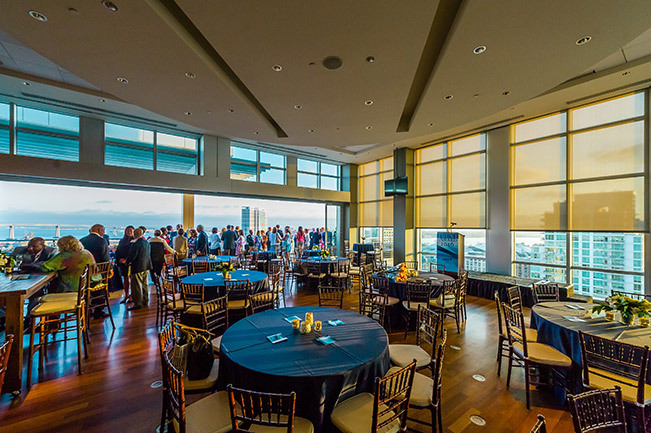 The Sky Box located in East Village, San Diego offers breathtaking views of the San Diego Skyline, San Diego Bay and Coronado, as well as direct views into Petco Park. Perfect for corporate events, the venue has plenty of A/V built in, and black out & mesh drop down shades. Natural light is great, but always create a plan to dim the room for presentations! Although we haven’t planned an event in San Diego just yet, we’re waiting for the perfect opportunity to utilize one of these great venues for our clients. Want to see more from our events held all over the country in Los Angeles, Nashville, NYC, Las Vegas Orlando and more? Check out our gallery here. Which city would you like to see featured next?